After the twin victories of Brexit and Trump in 2016, observers across the political spectrum described a face-off between populism and neoliberal globalism. Davos Man, we were told, stood shamed before the wrath of the masses. In a series of electoral defeats for the center and left, the world’s elites were reaping the fruits of the inequality and democratic disempowerment they had sown. The Economist diagnosed a “new political divide” between “open against closed” national economies, while scholars lined up to explain how the so-called inward turn was a natural and inevitable reaction to deepening chasms of wealth inequality. This year, attendees at the World Economic Forum might have breathed a sigh of relief, believing that immediate threats to their existence had passed. Yet members of the so-called populist right in Germany and Austria entered parliament after big wins in elections at the end of last year. Their victories seemed to fit perfectly into the old storyline. Alternative für Deutschland and the Austrian Freedom Party were cast as the latest vessels of a popular resentment born of economic anxiety and the instability of mass migration. A closer look at these standard-bearers of the Right raises doubts about whether ‘pitchfork against penthouse’ captures the current political moment fully. Why does one of the Austrian Freedom Party’s coalition negotiators direct an institute named after the patron saint of the market-conservative movement, Friedrich Hayek (granted a Presidential Medal of Freedom by George H. W. Bush in 1991)? Why is the AfD parliamentary delegate for Munich — and now chair of the parliamentary budget committee — a libertarian blogger and precious metals consultant who sold ingots autographed by the party leaders at their conventions? And why were many of that party’s academic advisors and leading lights also members of an affiliated Hayek Society in Germany, including Mont Pelerin Society members Roland Vaubel, Joachim Starbatty and one of its current party leaders, trained economist and former Goldman Sachs employee, Alice Weiland? In short, what were these would-be Davos People doing at the helm of parties built on critiques of Islam and opposition to non-white immigration? If we dig deeper, we find that neoliberalism and nativism only appear contradictory. History helps us to understand that the so-called populist parties of Middle Europe represent a strain of free market globalism, not its opposition. In the late 1930s a group of intellectuals, including Hayek, Ludwig von Mises, and others adopted the term “neoliberalism” to describe their agenda based on the conviction that laissez faire was not enough. The Great Depression paired with the rise of mass democracy meant that the market would not take care of itself. Wielding their ballots, electorates would always vote for more favors for themselves — and, thus, more state intervention into the economy — crippling the combination of market prices and private property upon which capitalism depended. From this time onward, as I describe in my recent book, one of the primary dreams of neoliberals was for institutions that would constrain democratic demands and protect the free movement of capital, goods, and (sometimes, but not always) people across borders. By the 1990s, it seemed that the neoliberal dream had been realized. The WTO, the European Union, and NAFTA — all inaugurated within two years of each other — locked in policies of free trade. A host of new legal instruments protected international investment and the IMF and World Bank had converted to policies of free capital movement. Yet at the moment of apparent triumph, some neoliberals, in Germany and Austria in particular, began to have second thoughts. Perhaps the EU was not the guardian of capitalist competition? Perhaps it was merely replicating the problems of bureaucracy and redistribution at a grander level? Changing demographics — an aging white population matched by a growing non-white population — also made some right-wing neoliberals and libertarians like Erich Weede, Gerard Radnitzky, and Hans-Hermann Hoppe rethink the necessary conditions for capitalism. Perhaps some cultures — and even some races — might be predisposed to market success while others were not? Perhaps cultural homogeneity was a precondition for social stability, the peaceful conduct of market exchange, and the enjoyment of private property? Others like the Social Affairs Unit, set up under the leadership of Digby Anderson within the Institute of Economic Affairs, began to wonder if the loosening of sexual norms since the 1960s had not also eroded the conditions for reproducing the free market order. The title of one of their volumes was stark: This Will Hurt: The Restoration of Virtue and Civic Order. The convergence of neoliberalism and social conservatism described so well by Melinda Cooper in her recent book was becoming even more explicit. Although Boettke himself has openly opposed the resurgence of exclusionary nationalism, it was out of such reflections such as his that the “populist” parties of Germany and Austria would emerge. Libertarians and neoliberals formed alliances with advocates of traditionalism, nationalism, and cultural homogeneity. Right-wing neoliberals in the new populist parties did not reject the dynamic of market competition; they deepened it. So-called “closed borders” libertarians continued to demand free movement for capital and goods — they simply drew a hard line against certain kinds of people. Perhaps most striking about what we could call a New Fusionism is the way it blends neoliberal beliefs about the market with dubious claims of social psychology. The fixation on intelligence testing is especially notable. While one usually associates the term “cognitive capital” with French and Italian Marxists, neoliberals like Murray used it as far back as 1994 in The Bell Curve to describe what he believed to be the partially heritable group differences in intelligence that could be quantified as IQ. The German sociologist Erich Weede, co-founder of the Hayek Society (granted its Hayek Medal in 2012), following the race theorist Richard Lynn, understands intelligence as the primary determinant of economic growth. The wealth and poverty of nations is not explained by history but the intractable qualities of its populations, according to former Bundesbank board member Thilo Sarrazin, whose book Germany Does Itself In has sold over 1.5 million copies in Germany and spurred the success of Islamophobic parties like the AfD, whose program is titled “Don’t Do Germany In.” Sarrazin also cites Lynn and other intelligence researchers to argue against immigration from Muslim-majority countries on the basis of IQ. An article about the rise of the far right in Germany published last year was titled “between Volk and capital.” But it might make more sense to combine them, as their proponents do themselves. We could call it a language of Volk capital. Right-wing neoliberals assign intelligence averages to countries in a way that collectivizes and renders innate the concept of “human capital.” They add overtones of values and traditions that cannot be captured statistically, shading into a language of national essences and national character. In November 2017, Thilo Sarrazin shared the stage with Erich Weede at the Hayek Society’s Freedom Forum in Berlin. Both speakers argued in favor of tight borders to preserve strong property rights and bemoaned the burden placed on state budgets by immigrants who “bring little or no human capital with them,” as Weede put it. Weede and Sarrazin made another telling — and seemingly paradoxical — argument: that closed borders were necessary to save globalization. “Knowledge, goods and ideas” should be free to migrate, Sarrazin said. People, however, did not have to move “in large numbers.” That had already “brought nothing but deterioration.” While the extension of production chains and cross-border trade had led to the economic uplift of distant foreign populations as a group, immigration only helped the small number who made the risky voyage. “Even under pure humanitarian (Rawlsian) criteria,” Weede added, “it would be bad if mass migration threatened global free trade.” People must remain fixed so that capital and goods can be free. 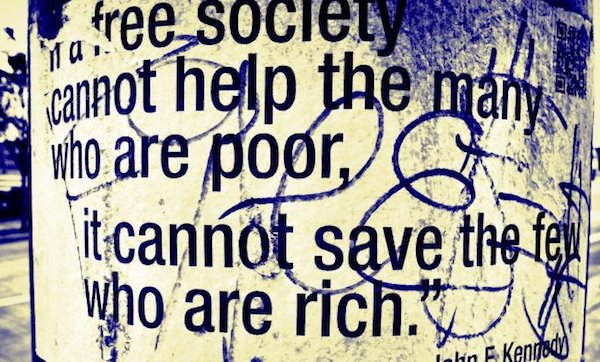 In particular, the world’s poor needed to remain segregated from the world’s rich. When asked “what kind of immigration would be good,” Weede answered, “exactly the opposite of the kind we are getting.” To secure economic freedom and social stability and to avoid civil war, large-scale migration from African and Asian countries must end. Weede suggested two alternatives drawn from fellow Mont Pèlerin Society members. One was Gary Becker’s proposal of selling “the right to immigrate” for a fee. The second was Richard Posner’s proposal of IQ tests to screen would-be migrants. This was not a swing from open to closed, but a modified openness informed by neoliberal ideas of human capital, the knowledge economy, and the prerogatives of wealth and competition – ideas entirely at home on the peaks of Davos. Contemporary right-wing populism in Germany and Austria emerged within neoliberalism, not in opposition to it. This is not the wholesale rejection of globalism but a variety of it, one that accepts an international division of labor with robust cross-border flows of goods and even multilateral trade agreements while tightening controls on certain kinds of migration. As repellent as their politics may be, these populists are not barbarians at the gates of neoliberal globalism but the offspring of that line of thought itself. The reported clash of opposites is actually a family feud. Quinn Slobodian is ACLS Frederick Burkhardt Residential Fellow at Harvard University’s Weatherhead Initiative on Global History and associate professor of history at Wellesley College. His most recent book is Globalists: The End of Empire and the Birth of Neoliberalism (Harvard University Press, 2018).